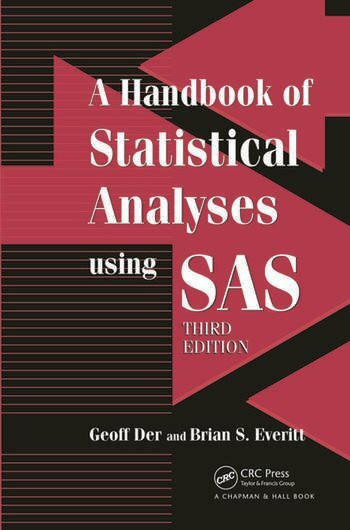 Updated to reflect SAS 9.2, A Handbook of Statistical Analyses using SAS, Third Edition continues to provide a straightforward description of how to conduct various statistical analyses using SAS. Each chapter shows how to use SAS for a particular type of analysis. The authors cover inference, analysis of variance, regression, generalized linear models, longitudinal data, survival analysis, principal components analysis, factor analysis, cluster analysis, discriminant function analysis, and correspondence analysis. They demonstrate the analyses through real-world examples, including methadone maintenance treatment, the relation of cirrhosis deaths to alcohol consumption, a sociological study of children, heart transplant treatment, and crime rate determinants. With the data sets and SAS code available online, this book remains the go-to resource for learning how to use SAS for many kinds of statistical analysis. It serves as a stepping stone to the wider resources available to SAS users. Simple Linear Regression: Alcohol Consumption and Cirrhosis Deaths and How Old Is the Universe? Exercises appear at the end of each chapter. Geoff Der works as a consulting statistician at the Medical Research Council Social and Public Health Sciences Unit in Glasgow, Scotland. His current research interests include the relationship between cognitive functioning and health, income and health, and models for longitudinal data. In 2005, Brian S. Everitt retired from being head of the Department of Biostatistics and Computing in the Institute of Psychiatry at King’s College London, UK. Currently working on his 60th statistics book, he acts as a statistical consultant to a number of companies. …Overall, the structure that was chosen by the authors is effective in making the reading entertaining and engaging. The third edition of this handbook will prove to be an extremely useful reference tool for current and future SAS users. … Like the first two editions, this edition emphasizes how to conduct a range of statistical analyses using the latest version of SAS, version 9.2. … I think the authors did a nice job in achieving the targeted goal. The SAS programs and data used in this edition are available online. The Output Delivery System (ODS), the new graphic procedures, and ODS graphics can be used for presenting the results. I expect that SAS users will appreciate this feature of the edition. … In summary, SAS users will find the new edition quite useful. …The major distinction between this edition and previous versions is that this edition uses new procedures that are available in SAS version 9.2 to make data analysis easier and to provide results that are ready for publication through the output delivery system (ODS), the new graphics procedures, and ODS graphics. … This book combines data management using the SAS system and data analysis into one book. … There are many positive aspects of the book. It is a great reference for someone who is already familiar with the SAS language and the statistical techniques. It cuts out all of the intricate detail and gets to the basic steps needed to perform a particular analysis. The book has shortcuts to reduce the time spent on common tasks. It also has an excellent introduction to the new graphical capabilities of SAS V9.2, which would elate anyone who has used previous versions of SAS graphics by the inclusion of new capabilities. 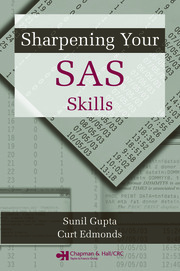 … a simple manual for using SAS. 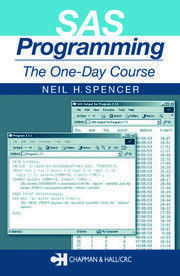 It has put thousands of pages of SAS manuals in less than 400 pages of a paperback … The authors have again done an excellent job of explaining each statement as well as the resulting output … In summary, the handbook introduces SAS programming through a number of data sets of varied complexity, makes the data sets suitable for analysis through programming statements, then uses SAS procedures for analysis. SAS procedures and the resulting outputs are properly explained and suggestions for appropriate analyses are provided where necessary. … an excellent handbook for a beginning SAS user. Statisticians and nonstatisticians can both benefit from this book.